Without a doubt, this is the software that Google should have developed itself. It makes Gmail so much more enjoyable and easy to use. Google offers a huge range of online services, but the problem with most of them is that you are tied to your web browser when you want to use them. If you use multiple Google tools – such as Gmail, Google Calendar, Google Drive and so on – you may find that you struggle to work with them alongside all of the websites you have open. 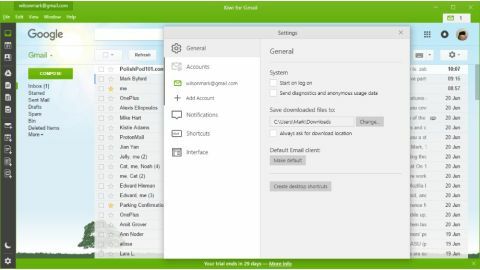 Kiwi for Gmail is a simple solution that pulls these services out of your browser and transforms them into a desktop app. It's a wonderfully simple idea and the software manages to feel almost like a native Google app. With pinnable desktop shortcuts for all of the main components, you'll find that it's much easier to create new documents and jump to different services, and the ability to use Alt+Tab to switch between them is a real boon. It's worth pointing out that Kiwi for Gmail Lite initially installs as a 30-day trial of the premium edition, which enables you to work with up to six Google accounts and the full complement of G Suite apps. A full subscription costs a mere $9.99 per year (about £8, AU$13), but if you decide not the upgrade at the end of the trial period you'll be dropped back into the free tier, which means you can only use one Google account. You'll also be limited to working with Gmail and its associated tools: calendar and contacts. Apart from the fact that your inbox, calendar and Google documents have been wrenched from the Google website and relocated into their own program window, the interface is exactly the same as the one you're used to. In many regards Kiwi is just a wrapper for the web apps offered by Google, and this is no bad thing. If you work with multiple G Suite tools, Kiwi's shortcut bar and universal shortcuts makes life so much easier, but it's also very easy to get overwhelmed with windows – the ability to group things together in tabs would have been nice. Notifications can get a little too much, but they can be tamed by switching settings so you are only told about important notifications, or by activating the Do Not Disturb function.